Nothing can match the excitement of the annual Notting Hill Carnival – Europe’s biggest street festival attracts an estimated two million people to West London to enjoy the party atmosphere every August. The carnival is a vivid spectacle that celebrates London’s diverse and magnificent multicultural make-up, bringing everyone together for a giant party that shouldn’t be missed. 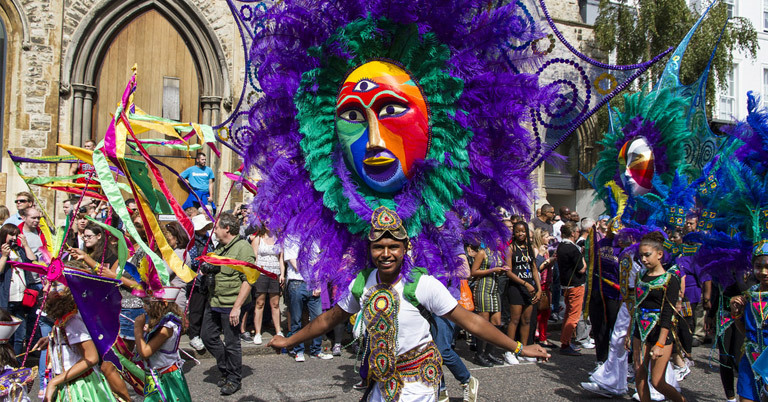 Notting Hill Carnival 2018 is due to take place over the August Bank Holiday weekend, and there’s sure to be something for everyone to enjoy! The annual celebration of the local community’s traditions and heritage first started in 1966. Thanks to the efforts of local women Rhaune Laslett and Claudia Jones, the Carnival was in response to the horrific racial tensions of the 1950s. Notting Hill had a large population of West Indian immigrants, who had come to the UK as a result of the post-World War II labour shortages. They joined Irish, Jewish and European refugees in the impoverished area, struggling for survival in overcrowded housing. British politician Oswald Mosley, who had become leader of the British Union of Fascists in the 1930s after failing to be re-elected, preached race-hate with his Keep Britain White campaign to exploit racial tensions. This culminated in the Notting Hill riots of 1958. Against this backdrop, Trinidad-born Jones decided to do something positive for the community. After founding The West Indian Gazette newspaper in 1958, she went on to organise a Caribbean carnival in 1959. Televised by the BBC, it was aimed at showcasing Caribbean culture and building bridges to unite the shattered community. It was to be a one-off event, until social worker Laslett, who was of Native American descent, organised another festival in Notting Hill in 1964. She was a familiar figure in the local community, working to heal the racial and class-based tension in the area. She had already organised other initiatives when she had the idea of a festival, saying she pictured a multi-racial community, dancing joyously together through the streets. While Jones’ 1959 festival had a mainly Caribbean theme, Laslett’s 1964 celebration embraced all cultures. People taking part came from India, Nigeria, Czechoslovakia, Ghana, Ireland, the West Indies and many other places. Laslett booked Trinidadian musician Russell Henderson to lead his steel band at the event, which led to an impromptu parade through the streets of Notting Hill. As it proved so popular, in 1966 the event returned as the official Notting Hill Carnival and has taken place every year since. A spectacular parade with floats, costumed performers and steel bands will make its way through the streets. There will be plenty of live music, including dub, reggae and salsa, 37 static sound systems and lots of Caribbean food. The carnival takes place throughout the W10 postcode area in West London, with the main celebrations taking place around Notting Hill, Wesbourne Park and Ladbroke Grove. People will be lining the streets to watch the colourful main parade, setting off from Great Western Road, before continuing along Chepstow Road, Westbourne Grove and Ladbroke Grove. The parade begins at 9.30am on the Sunday. Apart from the main events, you’ll find another side to the carnival down every side street, where music will be playing on sound systems and people will be dancing in the streets. Don’t think the carnival is just about the parade, or you’ll miss these “pop-up parties”, which can be great fun. Lots of people take their children, with Sunday traditionally being family day. It’s always best to arrive early to beat the crowds – and a recommended tip is to write your mobile phone number on your child’s arm, just in case they get lost in the crowd! You’ll never be far from the delicious aroma of a smoking barbecue, with the most popular dishes including jerk chicken and rice, curry, ackee (a tropical West African fruit) and salt fish. There are also vegetarian options such as veggie patties, curries and chips. Once the main event is over, there are plenty of opportunities to continue the fun at one of the many after-parties, so booking the next day off work is highly recommended! If you’re planning a trip to London to enjoy Notting Hill Carnival, why not hire a minibus from H&H Van Hire? Providing a cost effective and convenient solution, our weekend hire is a popular option for group outings. Please contact us for details of our modern nine, 14 and 17-seater minibuses. Suppliers/stall holders could also benefit from our Luton van hire options!